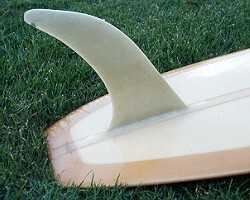 1966 Gordon Woods, Malibu 8 ft 10"
Foam blank, two glue-line stringers, Volan tint glassed with 2" rail overlap.Post production legrope tab. Deck: rolled with concave nose and shaped kneeling wells. Bottom: flat, slight round, soft round, flat. Deck: Gordon Woods black/red script at centre. Deck: 6905 -pencil at tail, - bottom? BOARD HISTORY: Photographs and dimensions DV8s Old Mal Rally, April 2001. COMMENTS : A rare example of the use of resin tint.